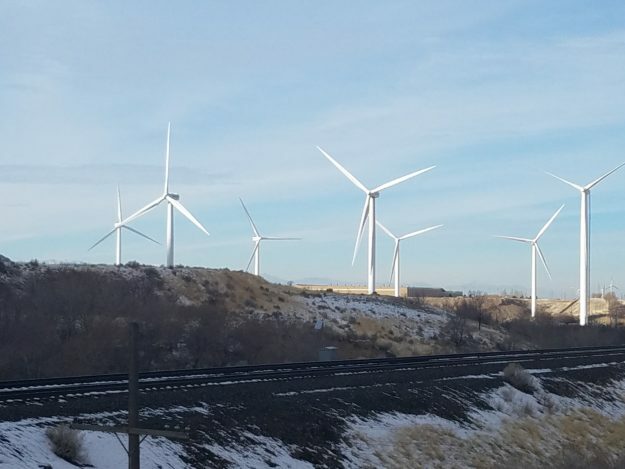 Wind turbines outside of Provo, Utah. Colorado and its neighbor to the West both want to host the Winter Olympics, but energy and public lands policies may come into play (David O. Williams). Denver Mayor Michael Hancock’s exploratory committee established to determine if the city and surrounding state should try to host either the 2026 or 2030 Winter Olympics on Tuesday kicked off a campaign to gather public input on the possibility. But the clock is ticking on the United States Olympic Committee submitting a 2026 bid, with the International Olympic Committee’s deadline of March 31. The USOC has previously indicated it would prefer going after the 2030 Winter Olympics. The United States last hosted the Winter Olympics in Salt Lake City, Utah in 2002 and the Summer Olympics in Atlanta in 1996. Los Angeles will host the 2028 Summer Olympics and therefore has sponsorship and marketing priority over the Winter Games, which makes 2026 more complicated. “We have encouraged the three cities from the U.S. that are interested in potentially hosting – Reno-Tahoe, Salt Lake City and Denver – to be in a dialogue with the [International Olympic Committee], and that is happening,” Blackmun added in December. Fraser Bullock, co-chairman of the Utah committee, said 2030 is better for raising money because Los Angeles 2028 has exclusive fund-raising rights in the United States. “But if nobody else bids for 2026, we would certainly be available,” Bullock said, according to the AP. Some in Colorado would like to use an Olympic bid to not only procure infrastructure upgrades but also promote the state’s comparatively progressive stance on issues such as public lands and renewable energy compared to neighboring and far more politically conservative Utah. Colorado recently pulled the Outdoor Retailer show away from Salt Lake City over public lands policies. Denver voters previously rejected the 1976 Winter Olympics over funding and environmental issues, becoming the only city to ever be awarded the Games and later reject them. Following next month’s Pyeongchang, South Korea Winter Olympics, Beijing, China will host the 2022 Winter Games, followed by Paris hosting the 2024 Summer Olympics. Other cities considering bids for the 2026 or 2030 Winter Olympics include Sion, Switzerland; Calgary, Canada; and Sapporo, Japan. DENVER (Jan. 30, 2018) – The exploratory committee charged with determining if Denver and Colorado should submit a bid to host an Olympic and Paralympic Winter Games announced opportunities [Tuesday] for community members to share their input. The in-person meetings and online forums will provide community members an opportunity to ask questions and share their opinions about potentially hosting a Winter Games. A new website, www.explorethegames.com, provides general information about the exploratory process and offers visitors the opportunity to participate in a survey to share their feedback. Furthermore, online meetings for community members are being conducted on Thursday, Feb. 8, from 6:00 p.m. to 7:00 p.m. MT and Saturday, Feb. 24, from 9:00 a.m. to 10:00 a.m. MT. Details about the online community meetings can be found at www.sharingthegold.org. Members of the exploratory process are attending as many meetings as possible at civic, business and nonprofit organizations in the Denver metro area and along the I-70 mountain corridor. Additionally, “Sharing the Gold” advisory groups, composed of several key constituencies, are being assembled in the Denver metro area and mountain communities in which a Winter Games would likely take place if Denver and Colorado were to pursue a bid. These advisory groups will provide recommendations to the Exploratory Committee in March, and those recommendations will be considered among a variety of factors the committee is exploring. Mayor Michael B. Hancock, with the support of Colorado Governor John Hickenlooper, assembled a group of civic and community leaders from around the State of Colorado in Dec. 2017 to determine whether Denver should submit a bid for a future Olympic and Paralympic Winter Games when the United States Olympic Committee (USOC) issues a call for U.S. candidates. Denver’s exploratory committee is, first and foremost, determining if hosting a future Olympic and Paralympic Winter Games would be good for Denver and Colorado. That includes identifying ways for the Games to be financed privately, while still meeting all of the requirements of the International Olympic Committee (IOC). The exploratory committee is also exploring what legacy an Olympic and Paralympic Winter Games would leave for Denver and Colorado, establishing the appropriate forums for community input, and examining a number of aspects related to hosting a Winter Games, such as financing, environmental impact, Games operations, protocol, process and timing. The exploratory committee is chaired by Cohen. The committee’s findings will be presented to Mayor Hancock and Gov. Hickenlooper in March 2018. Denver Sports Commission, an affiliate of VISIT DENVER, The Convention & Visitors Bureau, was founded to help bring high-profile sporting events to Denver, and is involved in the exploratory efforts. Any decision to submit a bid for a future Olympic and Paralympic Winter Games will be based on the assessment completed by the exploratory committee, as well as any outcomes related to the IOC and USOC decision-making processes. The USOC is the sole entity that will determine whether to submit a bid for the Olympic and Paralympic Winter Games, and it can only submit one U.S. bid city to the IOC.